This lovely Montepulciano d’Abruzzo comes from the house of Italo Pietrantonj, a family winery that has been making wine in the same estate in the small town of Vitorita since 1830. This is great, rustic Montepulciano from the oldest winery in Abruzzi. The wine is unfined, unfiltered and fermented in cement tanks. 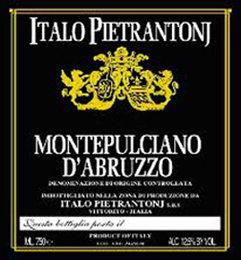 Montepulciano d’Abruzzo is one of Italy's most famous wines, and can be found on wine store shelves all around the world. This classic, well-rounded, plum-scented Italian red is made from Montepulciano grapes grown in the Abruzzo region, on Italy's Adriatic coast. The Montepulciano d'Abruzzo DOC title was created in 1968, and covers a vast area of eastern Abruzzo. It spans all 75 miles of Abruzzo's and spreads inland for roughly 20 miles. Much of western Abruzzo is too mountainous for effective viticulture, so most Montepulciano d'Abruzzo wines come from the low hills, plains and coastal areas. Montepulciano, one of Italy's most popular red wine grapes, has thrived in Abruzzo since the middle of the 18th century. A plump grape, which gives good yields of easy-drinking wine, it is popular with producers and consumers alike.